We're Proud to Be Your One-Stop Shop for All Your Luxury Driving Needs! With 70 years of experience as a family owned and operated dealership in New Jersey, our team knows what it takes to deliver a truly outstanding shopping, buying, and ownership experience. We always put our customers' needs first, and since we're local to the Watchung, NJ area, we're always there when you need us. Whether you're looking to buy your first luxury vehicle, enjoy the benefits of a great pre-owned model, or get the quality service and maintenance all cars need, Liccardi Lincoln wants to be the family-owned dealership that makes you feel like family, too. So come see us on 1615 Route 22 in Watchung for all your automotive needs. Our philosophy has been the same simple approach for the last 70 years, so we think it's a winning formula: we put our customers first, attend to all your questions and needs, and ensure the highest-caliber buying or servicing experience. With trust, integrity, and respect at the core of everything we do, we find that drivers from the Watchung, NJ area appreciate our family-style approach. You can even expect to find Greg, Jeff and Kevin Liccardi in one of the Liccardi Auto Group showrooms in the Central Jersey area, since the family is still closely involved with all aspects of the operation! Whether you're new to the Lincoln Lineup or a longtime fan, one thing is clear, the moment you lay eyes on the elegant 2018 models - Lincoln is about sophisticated luxury without compromise. For those drivers with distinguished palates, the Lincoln Continental sedan delivers upscale design and incredible on-road performance, offering executive-level appointments for executive-level tastes. The Lincoln MKZ Sedan is no less luxurious than the Continental, but it does offer a smaller footprint and less-polish, more-sport than the Continental-plus, it's available as a hybrid! With the popularity of crossovers and SUVs on the rise, Watchung, NJ drivers will appreciate that the Lincoln lineup of SUVs offers power and sophistication-though it lacks compromise! Starting with the MKC, the balance of capability and comfort is deftly maintained, but if you need more space, consider growing to the Lincoln MKX, or the range-topping Lincoln Navigator SUV. This trio is great for families on the go, offering comfort and convenience without compromising on power or safety. Check out the new Lincoln lineup of vehicles today! Even if you're not looking for a brand-new Lincoln Navigator, finding your next daily driver in our dedicated pre-owned or Certified Pre-Owned Lincoln inventories is a great way to get behind the wheel at a more affordable price. We host pre-owned models from all kinds of brands, including Lincoln as well as luxury automakers like Acura, Volvo, Lexus, Audi, or INFINITI, but we also carry other options as well, like Jeep brand SUVs, Ford models, or Toyota models. Whatever you choose, drivers from Edison, NJ can trust the pre-owned vehicles found in our inventory because we screen every individual vehicle to check for quality before it appears among our listings. New or Used, Our Financing Team Works for You! No matter how you slice it, auto financing is rarely anyone's favorite part of a getting a new car. Fortunately, here at Liccardi Lincoln our professional financing team makes it painless and easy to find the perfect payment solution to go with your new Lincoln car, crossover, or SUV. How could financing a new or used car possible be easy? Simple: you financing or lease with LIccardi Lincoln! All jokes aside, we offer a number of online tools to make the entire financing process streamlined and simplified. For example, if you're planning to trade in your current used vehicle as part of your down payment, we have a convenient online trade-in appraisal tool to help you get a better sense of what it might be worth. More than that, we offer an online financing application for those drivers eager to skip the paper work and get to the good stuff-driving their new Lincoln vehicle! 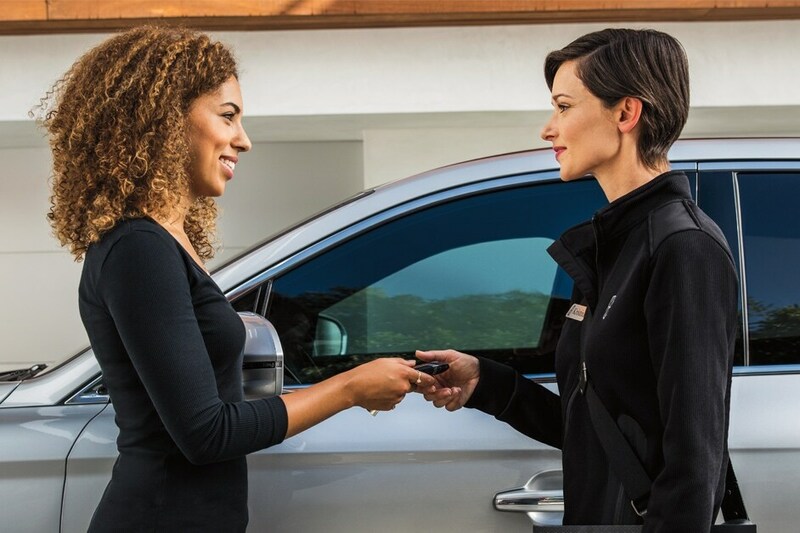 Whether you plan on financing with an auto loan or grabbing the wheel with a flexible Lincoln lease, you can count on the courteous and professional team in our financing department to have you back the whole time. When It's Time for Service & Maintenance, Trust the Team with 70 Years of Experience! Whether you buy your Lincoln new or used, somewhere along the line, it's going to need a little service and maintenance, which is where our dedicated Service Center comes into play. Maintenance is a big priority here at Liccardi Lincoln, and our highly trained technicians are able to work on all makes and models, not just Lincoln! Most services and repairs can even be performed in one day thanks to our robust Parts Department, which stocks over a million dollars in parts at any given time. How else can we make service and maintenance less of a hassle? Easy-Liccardi Lincoln offers convenient Saturday service hours as well as the ability to schedule your own appointment online! So, if you've had service on the back burner, you're fresh out of excuses! How Can You Find Us Here at Liccardi Lincoln in Watchung, NJ? Our Watchung, NJ showroom is easy to find, situated just off Route 22, and you can even get directions from your door to ours if you're coming from somewhere like Piscataway or Bridgewater, NJ. If you know where the Watchung Reservation or Milton Cambell Field are located, we're basically sandwiched between them!